Why not send Nancy your vacation photos? This just in: Some rocks have been discovered on the sea floor just off Aruba. As always, you can trust Nancy Grace to run with the stories the mainstream media are afraid to touch. It seems a retired couple was snorkeling when they came across the rocks. They were taking pictures of fish, and when they got home they discovered, as snorkeling retirees often do, that the pictures didn’t turn out very well. 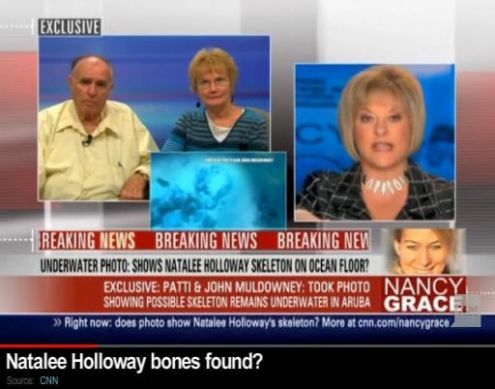 But the pictures of the rocks weren’t too bad, so they got Nancy Grace on the horn. As you can see, the rocks are an unusual bluish color. They are not the sort you see everyday by the side of the road. Nancy Grace likes the rock story. As we speak, she is consulting with her superiors at CNN to see if this breaking news does not merit three or four more crawls and visual elements, so that only the top of Nancy’s head is visible as the story unfolds. This isn’t something she likes to do normally, but these are some interesting rocks.